Harvard Business School Press, 9781633694361, 224pp. 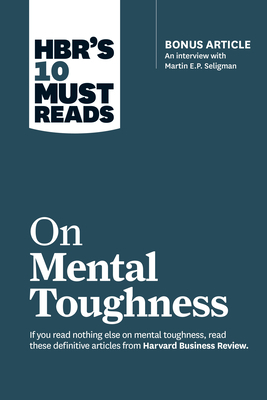 If you read nothing else on mental toughness, read these ten articles by experts in the field. We've combed through hundreds of articles in the Harvard Business Review archive and selected the most important ones to help you build your emotional strength and resilience--and to achieve high performance. Understand the tools your mind uses to recover from setbacks. This collection of articles includes "How the Best of the Best Get Better and Better," by Graham Jones; "Crucibles of Leadership," by Warren G. Bennis and Robert J. Thomas; "Building Resilience," by Martin E.P. Seligman; "Cognitive Fitness," by Roderick Gilkey and Clint Kilts; "The Making of a Corporate Athlete," by Jim Loehr and Tony Schwartz; "Stress Can Be a Good Thing If You Know How to Use It," by Alla Crum and Thomas Crum; "How to Bounce Back from Adversity," by Joshua D. Margolis and Paul G. Stoltz; "Rebounding from Career Setbacks," by Mitchell Lee Marks, Philip Mirvis, and Ron Ashkenas; "Realizing What You're Made Of," by Glenn E. Mangurian; "Extreme Negotiations," by Jeff Weiss, Aram Donigian, and Jonathan Hughes; and "Post-Traumatic Growth and Building Resilience," by Martin Seligman and Sarah Green Carmichael.